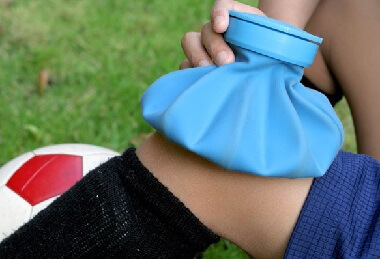 Rest Ice Compression Elevation is an age old mantra for the treatment of injuries. More recently, the extra category of "protect" was added so we now have the acronym PRICE. PRICE is usually the best first line knee pain treatment following an injury or flare up of pain. The aim is to reduce the internal bleeding and knee swelling to reduce pain and enable fast healing. Here, we will look at each of the components and how they work together. When Do You Use PRICE? The combination of protect rest ice compression elevation is especially appropriate for soft tissue injuries (muscle, ligament, tendon) and is considered more of a first-aid treatment than an end-all cure. When used appropriately, recovery time is shortened and discomfort minimized. That is why the protect rest ice compression elevation mantra has been so popular for such a long time. Most people can correctly recite the RICE treatment mantra of rest ice compression elevation, but it is really important to know how to do each part safely and effectively if you want it to help reduce pain and swelling to prevent further injury and speed up healing. Here we will look in more detail at the individual components of Protect Rest Ice Compression Elevation. Once a body part is injured, protecting it temporarily (first 48 hours) can limit any further injury and speed the recovery process. Protection might mean limiting the use of the knee, applying a splint, knee brace or bandage, or using crutches. You should avoid any activities that cause pain. Without rest, continual strain is placed on the area, which can lead to increased knee swelling, pain, and possible further injury. There is also a risk of the area not healing properly if it is not allowed to rest. However, the key is RELATIVE rest because at complete rest a muscle loses 3-5% of its strength every day! For a few days after an injury avoid putting too much weight through it or stretching it too much. It is really important to get moving again after a few days otherwise the muscles start to weaken and the joint stiffens. Find out more on how to rest appropriately including how to prevent any muscle strength loss while resting, and then check out the section on early knee exercises for ideas on how to start moving your knee safely. Always check with your doctor before starting any exercises. Ice applied for 10-15 minutes can help to reduce knee swelling and pain. When the knee is damaged, you get bleeding into the joint and an increase in the amount of synovial fluid. This causes problems for two reasons. Firstly, the fluid takes up lots of space and increases the pressure in the joint which limits knee movement. Secondly, there are chemicals in the fluid that aggravate the nerves causing pain. 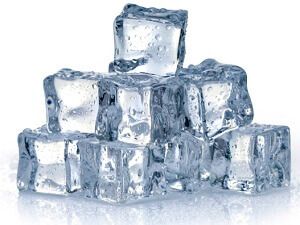 Using ice slows the flow of fluid and the rate of bleeding into the joint and therefore reduces the swelling and pain. However, when used incorrectly, ice can cause more damage so see the dedicated section on effectively using ice to decrease knee swelling. There are a number of different ways to apply ice including specially designed ice wraps and instant ice packs visit the ice wrap section to find out more. 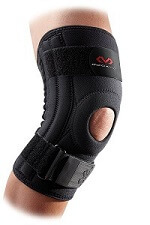 This helps to reduce knee swelling and provides some support to the joint. Although some swelling is inevitable, too much results in excessive pain, difficulty moving the knee, and eventual slowing of blood flow which slows healing. 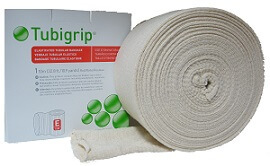 The most effective way to apply and maintain compression on the knee is to use a specially designed elastic bandage called Tubigrip. To find out more about how it works, how to use it safely and effectively and what size is right for you, visit the tubigrip section. Elevation works to reduce knee swelling by helping the excess fluid drain back into the body’s system. To be most effective, the affected area should be higher than the level of the heart e.g. for knee swelling the most effective way is to lie down flat with your leg raised supported on pillows. This can be done during the day and also overnight. Make sure there is some support directly underneath your knee, rather than just under your foot otherwise the knee will get very stiff. Elevation can be used for as long as swelling remains. So when we combine all those different elements we get our mantra, protect rest ice compression elevation. PRICE should be implemented as soon as possible after an injury to reduce the amount of damage. PRICE is a very effective knee pain treatment tool, particularly in the first few days following an injury. If you want to know more on the different elements of Protect Rest Ice Compression Elevation, visit the different sections. It may not always be necessary to do every stage of Protect Rest Ice Compression Elevation, so an element of judgement may be needed to tailor treatment to you. And remember, PRICE is not the be all and end all, and it is often necessary to use other knee pain treatment methods alongside protect, rest, ice, compression and elevation such as strengthening exercises, knee stretches and if all else fails surgery.